Click to see videosThe process of studying Leonardo the "Man" rather than Leonardo the "Brand Name" starts today! We will follow Leonardo's own hand as he wrote, drew and painted. The anatomy of the hand will be one of the main foundations for this experience. Art interpretation is subjective and complex, making it difficult to understand the complete intentions of any artist. Interpretations of Leonardo's works are varied and in our studies, we will attempt to use primary evidence whenever possible and the highest objective science when available. Our format for evidence will be primary, secondary and tertiary. However, some of these categories may overlap. Why now? We have been preparing a journal article outlining some physical characteristics of Leonardo's works which we hoped would be published this year. Bree Walker (a tv personality and child activist) presented us with an opportunity to discuss our theories on TV and it was determined that this was the right thing to do. stereotypes wax and wane. Approaching his works with a fresh view requires an open mind and a willingness to accept the transparent. During the process some revelations will be obvious, while others may be controversial. A most fortuitous revisit of his hand studies has led to the conclusion that both the weary hand sketch and the left hand of Jesus Christ in The Last Supper are examples of syndactyl or synpolydactyl hands. NellâUltima Cena, Cristo Ã¨ raffigurato con la mano sinistra caratterizzata da malformazione congenita, definita sindattilia. 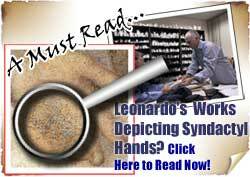 Why Leonardo da Vinci depicted Jesus Christ with an anomalous âLeft Handâ?